Jews for Boycotting Israeli Goods pays tribute to Veronica Planton, a dedicated campaigner for justice, who died of cancer at Guys Hospital in London on November 19, 2013. Veronica was a constant presence at demonstrations in London highlighting Israel’s injustices against Palestinians. 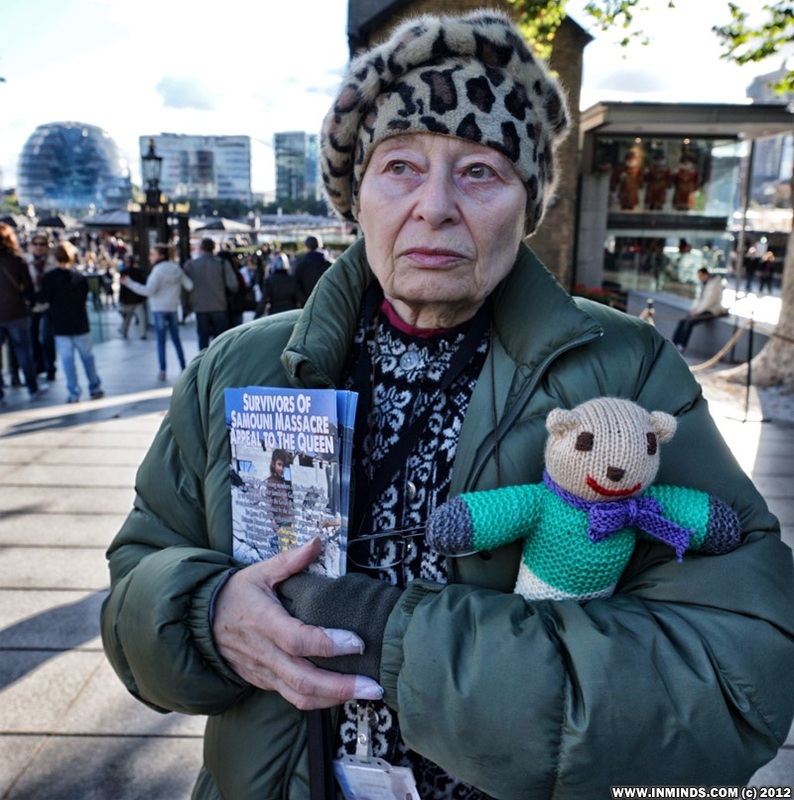 She played an active role in many of the boycott actions covered in this blog and initiated an inspirational campaign to send teddy bears to the children of Gaza. She also made use of her background in theatre and the arts in productions bringing to life the Palestinian experience. One of these, Love Letters to Gaza, was staged at the Calder Bookshop in October 2011 and formed part of an evening of poetry and theatre promoted by the Palestinian Solidarity Campaign (PSC). Veronica refused to allow ill-health to prevent her tireless work on behalf of her local community in the Waterloo district of London, the people of Palestine and the campaign for Boycott, Divestment and Sanctions. When it became too difficult for her to play an active role in street demonstrations on behalf of Palestinian prisoners or other causes, she continued to send the 700 supporters of her local Wandsworth and Lambeth PSC branch frequent emails containing carefully researched digests of news from and about Palestine. Tributes read to friends, relations and fellow activists who gathered for her funeral at the City Crematorium on December 3 testified to the range of communities in which Veronica had made her mark. Messages came from companions who had worked with her at the Sheffield Crucible Theatre in the 1960s, from members of the Coin Street community where she lived, from Palestine solidarity activists in London and in Palestine itself, and from the Moslem organisation Inminds which announced her death to the activist community. We are very saddened to announce that our dear sister Veronica Planton, a dedicated campaigner for the Palestinian cause, has passed away last week after becoming very ill in the spring. Despite suffering from severe asthma and always being breathless she passionately stood up for Palestinian rights. She regularly attended protests outside the Israeli settler store Ahava untill it finally closed down, then she joined protests outside the Tower of London in support of the Samouni family of Gaza whose children amongst others were massacred by the Givati Brigade of the Israeli army which is funded by the Steinmetz diamond company whose diamond was on display in the Tower of London. It was part of the Boycott Israeli Blood Diamonds campaign. The children were especially close to her heart and she ran a project to send teddy bears to the children of Gaza. After Israel’s brutal attack on Gaza, Veronica would carry a blooded doll at protests to symbolise the murdered children of Gaza. She also helped stage a theatrical performance for Gaza called “Love Letters to Gaza”. Rest in peace, our dear sister who showed us that even a debilitating illness cannot stop a person who has decided to fight for justice. I have no words to express how deeply sorry I am to hear about your great loss . I’m in shock to hear this news. My prayers and thoughts are with you all during this horrible time. I love you all and please give a big hug from us to each one who are attending the funeral . I would love to be there tojust to say the word. Its the time to say that we will follow up your steady search for justice and freedom.. This entry was posted in Uncategorized and tagged London, palestine solidarity activist, Veronica Planton. Bookmark the permalink.